MukoCell® is the first tissue engineering product worldwide for urological applications. In this section, you will find additional information regarding current problems in the treatment of urethral strictures as well as details on possible therapies. The course of treatment with MukoCell® will be explained further below. You will receive supplemental information regarding the innovative technology of tissue engineering and clinical development as well as further indications for MukoCell®. MukoCell® is used successfully by leading hospitals throughout Germany. For an overview of all hospitals and clinics, please contact us at Tel. : +49 231-97426370. Diseased or malformed urethral tissue can easily be substituted by a cultivated graft made from oral mucosa cells. Organic matter from cells, tissue or organs is referred to as graft. An autologous (also autogenous) transplantation means that the donor and the receipient is the same person. The advantage of such an autologous graft with patient’s own cells lies in the fact that the graft cannot be rejected by the patient’s immune system. The usage of cultivated grafts made from oral mucosa cells offers significant advantages for the treatment and surgery of a urethral stricture. There is no need to remove large segments of oral mucosa. Thereby all possible complications related to this method are avoided. Using an autologous graft shortens the duration of the surgery and with that the time being under anaesthesia. Further advantages of a graft made out of the patient’s own oral mucosa cells are the resistance to urine, its mechanical stability as well as the the high adjustment potential in terms of size and shape. After the implantation it develops into fully functional urethral tissue. Currently the autologous graft is used to treat urethral strictures and hypospadias. In urology the autologous graft from oral mucosa cells is the first tissue substitute in the field of tissue engineering. Tissue Engineering (Tissue reconstruction or tissue cultivation) describes the artificial production of biological tissue by cultivating cells. This tissue replaces or regenerates the patient’s diseased tissue. Generally, for this purpose cells are extracted from the patient and expanded in an advanced pharmaceutical clean room laboratory. Depending on the type of cell they can be cultivated on so called carrier substances (structural framework). 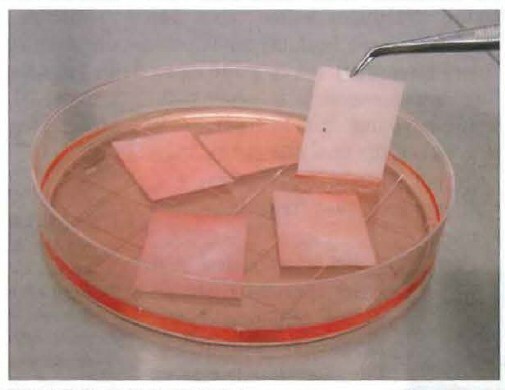 Tissue Engineering products belong to the group of pharmaceuticals for advanced therapies and is one of the application examples for the regenerative and personalized medicine.